The United States Permanent Representative to NATO (commonly called the U.S. Ambassador to NATO) is the official representative of the United States to the North Atlantic Treaty Organization. The current U.S. 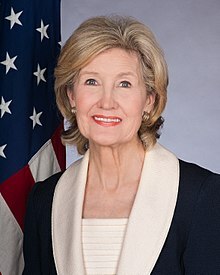 Ambassador to NATO is Kay Bailey Hutchison since August 2017. The Representative has the rank of full ambassador and is appointed by the President and confirmed by the Senate. The full official title of the Representative is United States Permanent Representative on the Council of the North Atlantic Treaty Organization, with the rank and status of Ambassador Extraordinary and Plenipotentiary. The first Representative was appointed by President Dwight D. Eisenhower in 1953. This page was last changed on 3 October 2018, at 01:05.